Known as ishigame in its native Japan, the Japanese pond turtle (also called the Japanese stone turtle) is an aquatic turtle that can be found in the freezing fast-flowing waters of Kyushu, Shikoku, and Honshu. They also live in cool ponds and streams as well as in man made water features such as irrigation ditches and canals. 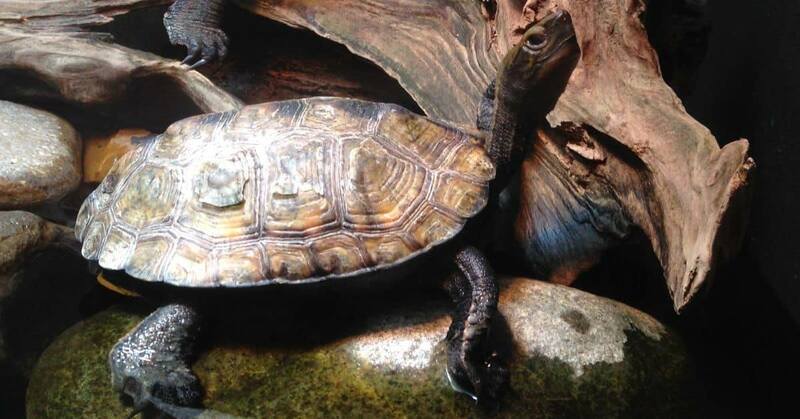 An interesting adaptation of this turtle species is their ability to hibernate at the bottom of ponds and streams. You’re probably wondering how they breathe down there, well, they don’t. They actually absorb oxygen from the water with the use of their tail. 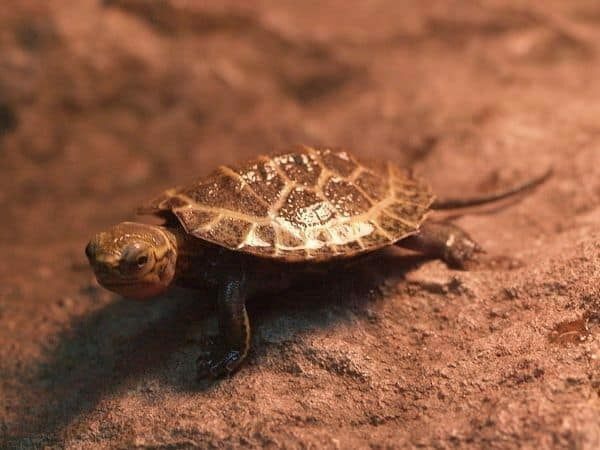 As evident by the name, the Japanese pond turtle is native to Japan, particularly Kyushu, Shikoku, and Honshu of the main islands and several other smaller islands adjacent to them. They are also popular pets, especially in Japan. This turtle belongs to the family Geoemydidae and is biologically known as Mauremys japonica. The Mauremys japonica is known to have an average lifespan of 20 years. The pond turtles are moderate in size among the family Geoemydidae. The carapace length of an adult female is about 20 cm/7.9 inches, while the smaller male grows to about 14 cm/5.5 inches. Their shells (carapace) are yellowish brown to dark brown or even black, while their heads are olive brown. Their shells have a single ridge, which is serrated at the back edge. Both the male and female have tails, although males have longer tails. Finally, these turtles have orange lines on both sides of their legs. Wild Japanese pond turtles eat adult frogs, larvae, fish, shrimp, crabs, crayfish, aquatic insects, earthworms, algae, water weeds, and even fruit. The pond turtles eat both under and out of water. Feeding pet Japanese pond turtles is not difficult, as they will eat whatever is given to them. As mentioned above they enjoy eating fish, earthworms, snails, cricket, shrimp and other sources of protein. They also eat lettuce, green pepper, green beans, and shredded carrots along with fruits like melon, strawberries, plums, and grapes. You can also feed them commercial turtle food. When possible, you should supplement their diet with natural foods like the ones mentioned above. Commercial turtle foods you can feed them include Reptomin Floating Food Sticks, and Rep-Cal Maintenance Formula Box Turtle Food. While adults feed every other day, young Japanese pond turtles need to feed daily. Wild Japanese pond turtles live in fresh ponds and streams. They don’t mind the cold temperatures of the freshwater bodies where they are commonly found. They can quickly adapt to fast flowing water and are strong swimmers. 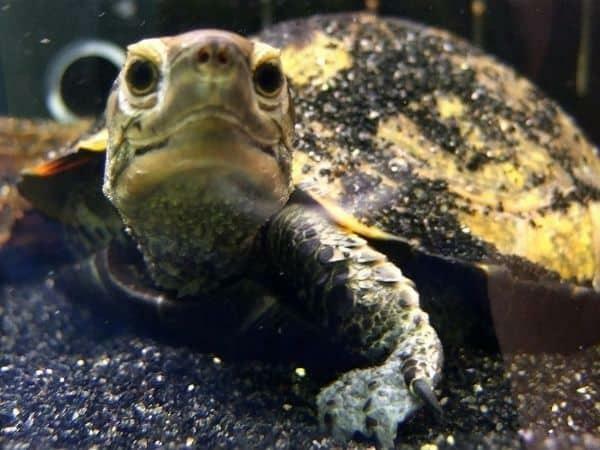 If you want to keep a Japanese turtle as a pet, you need a large aquarium as they spend most of their time in water. The amount of water in the aquarium needs to be at least 40 gallons for a single adult. The aquarium itself needs to be around 50 sq. ft. in size. You should have aquarium gravel on the bottom of the aquarium as well as other aquarium features. A good rule of thumb for tank size is 10 gallons for every inch of turtle. I realize that can get quite large quite quickly, but of course you will want the best for your pet turtle. Although the Japanese pond turtle spends most of their time in water, they do need to bask. This basking area needs to be large enough for the turtle to maneuver with ease. Also, the basking area needs to be accessible to the turtle. We did a review of the best turtle docks which you may find helpful when choosing one. You also need to provide light for the turtle. A special reptile light such as the OMAYKEY Ceramic Heat Lamp should be positioned over the basking area of the aquarium. In addition, a UVB light will help provide the turtle with the needed rays to synthesize vitamin D3. The lights have to be off for about 12 hours each day so as to mimic the passage of day and night. If you can position the turtle tank at a window that receives a long hours of natural sunlight, then you may not need the UVB light. We have another guide on the best uvb bulbs which will give you some direction in the lights you need too. Japanese pond turtles are well-adapted to cold temperatures, but you still need to maintain a nice environment for them. The temperature of the water should be around 77 degrees Fahrenheit while the temperature of the basking area has to be around 80 Fahrenheit, at most 85 degrees. Japanese turtle mating season starts in September and ends in April the following year. The female lays up to four clutches of eggs per year with each clutch consisting of three to eight eggs depending on the size of the female. As with many aquatic turtles, the Japanese pond turtle is more predator than prey. They usually prey on fish, fronts, aquatic insects, mollusks, tadpole, and other small amphibians. While the pond turtle is not endangered, they are listed as near threatened by the IUCN. It is not advisable to keep wild pond turtles as pets. This video gives a great view of a japanese turtle sticking its head out and looking around. You can clearly see its feet, shell and neck which may help you in identifying one if you ever come across one. Caring for the Japanese pond turtles is relatively low maintenance and they are great pet lovers of all levels. They usually live between 20 and 40 years and make great lifelong companions. So, over to you! What do you think? Are you going to get one? Do you already have one? Leave a comment below!